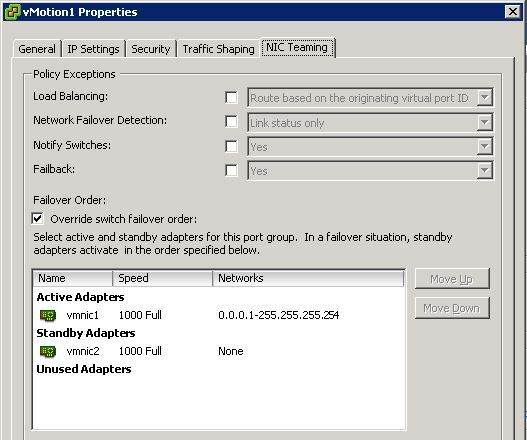 One of the coolest new features in vSphere 5 is the ability to use multiple network adaptors for vMotion traffic. This will work on Standard vSwitches and Distributed Switches. It does not require any special license. If you have vMotion licensed you can use the feature. Prior to vSphere 5 vMotion traffic would only use one physical network adaptor. It did not help to add multiple adaptors and change load balancing to IP Hash and bond the physical nisc in an etherchannel. That meant the only way to increase vMotion throughput was to upgrade from 1Gb to 10Gb Ethernet! Not a plausible solution for everyone. In order to use this new feature you need to configure multiple vmkernel adaptors for vMotion. Actually you will need to configure one for each physical adaptor connected to the vSwitch. In my example I want to use two physical adapters for vMotion (vmnic1 and vmnic2). First I create a new vSwitch and create two vmkernel adaptors for vMotion. The vmkernel ip addresses are in the same subnet. After creating the two vmkernel interfaces on the vSwitch we need to set “vMotion1” active on vmnic1 and standby on vmnic2. We will then set the “vMotion2” interface active on vmnic2 and standby on vmnic1. Now you have 2Gb of throughput for your vMotion network. If you need more throughput just add more physical nics and create extra vmkernel interfaces. 1. Select your ESXi host in the vCenter inventory. 5. Then create a graph with “network” realtime and choose the nics you are using for vMotion. Either choose “data transmit rate” or “data receive rate” – make the graph stacked. 6. Start a vMotion and check that every nic is loaded.